After getting so much information about the inflatable kayak itself, it is necessary to know whether they are actually safe enough? 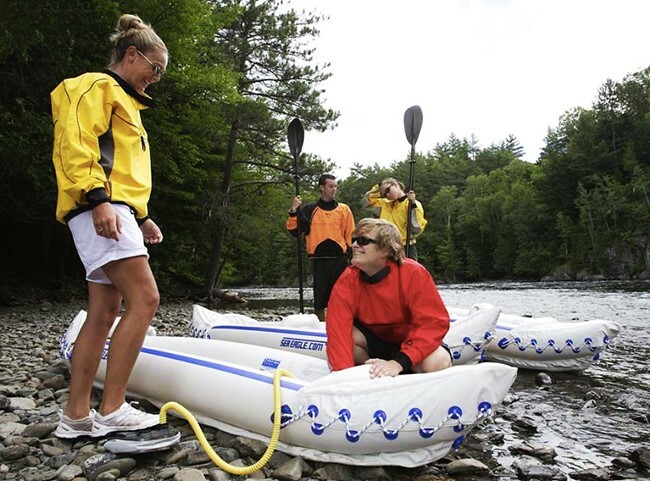 We all know that inflatable kayaks has excellent properties like low-cost, ease of storage, light-weight and portable. A However it is also important for us kayak rider, to know that it is safe to ride in one. So, are these type of kayaks reliable in terms of safety? We all know that every type of products made, whether expensive or inexpensive, surely will have their own pros and cons. Well, by reading the following points below, you can understand more on the safety issues and drawbacks of the inflatable kayaks. They are lighter in weight so the wind can disturb the kayak easily and can turn the entire kayak when the flow of air or air pressure is much higher. Because of their light weight it’s not for the rider to keep the kayak in a straight path in comparison of heavier boats. Once you lose control of the kayak, it will be very difficult for you to keep the inflatable kayak back in a straight path. This can be very risky for a beginner level rider to control. Although this is not a safety risk, it is more of a drawback. If you are looking to go on a ride using the inflatable kayak, then this is the first thing you should know, it requires quite a fair amount of time for pumping and setting up. After using the inflatable kayaks, you also should have to dry it out after using them. Hence, it will take quite a fair amount of time for drying them out and later packing them as well, although some modern inflatable kayaks nowadays manage to counter this problem. Read this article from Dreamguides as it does a comprehensive coverage on the best inflatable kayaks available in the market today. Having lighter weight in comparison to other types of kayaks creates another major drawback which is its durability. They can’t travel for a very long time while the heavier kayaks is able to accomplish this regularly with ease. The ancient inflatable kayaks have this problem often but nowadays, some of the modern inflatable kayaks are much durable and they manage to solve this problem. When we are constantly thinking whether inflatable kayaks are safe or not, we should first understand the type of materials used in constructing the inflatable kayaks. They typically compose of rubber synthetic, nylon and polyester that are not so reliable when it comes about using them on water. Some good inflatable kayaks are made of better materials but they are more expensive, so make sure to be aware of that. Safety should never be compromised. So after knowing the drawbacks and disadvantages of inflatable kayak, it will become much easier for you to think about the safety element of the inflatable kayaks. By knowing all these facts, you will also agree that the inflatable kayaks are actually not that risky as modern inflatable kayaks are much safer than before. Although slightly more expensive, you can enjoy riding on them without any risk as they are totally safe.